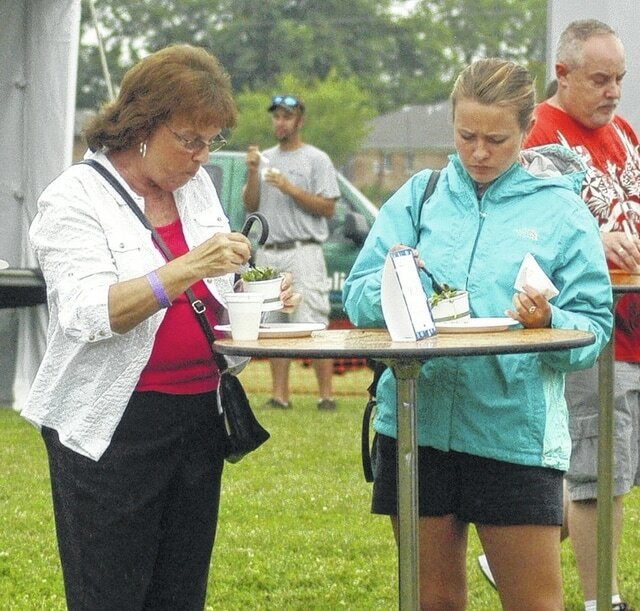 VANDALIA — The 8th Annual Taste at the Crossroads is set for Tuesday, June 23 and, for the third straight year, will return to the Vandalia Sports Complex on Stonequarry Road. The event, which has steadily grown over its first seven years, will be from 5 – 9 p.m.
16 food vendors are currently scheduled to attend and eight craft beers will be offered at the Taste. Roberts said that Liquor and Wine Warehouse will offer eight different wines, with four red wines and four white wines, as well as domestic beers. Water and soft drinks will also be available. The admission ticket covers all-you-can-eat food samples. Beverages, including water, soft drinks, beer, and wine will require a separate ticket purchase. The event is family friendly as well with a live DJ, Ice sculpting demonstrations by Ramon, and fun balloon creations for children of all ages by Jeff Whisman. Attendees can even get a relaxing chair massage from Pampering Palms Massage. Butler Township Trustee Mike Lang and friends in the Backyard Brewing Society will give a demonstration on home beer brewing. Restaurants attending are Boston’s Bistro, Cardinal Catering, Creatif Catering, El Toro, Frickers, Hooters, Kohler Catering, Kroger Bakery, Longhorn Steakhouse, McDonald’s, Max & Erma’s, Olive Garden, Skyline Chili, Subway, Walmart Bakery, and Warehouse 4 Coffee. Pre-sale tickets are available for $12 at the Chamber office, Abbey Credit Union, DayAir Credit Union, and Monroe Federal Savings Bank. Tickets at the Chamber will only be available through close of business Monday, June 22. Tickets at the gate are $17. Children nine and under are admitted free with a paid adult. “I would encourage people interested in coming to get their tickets early,” said Roberts. “A family who may have to pay for two or three can really save by getting tickets in advance.